Full disclosure: I have spent a significant, perhaps unreasonable percentage of my monthly salary on SoulCycle classes since 2012. While I&apos;ve visited studios on both coasts, the setup is fairly streamlined: Once riders enter, they&apos;re surrounded by racks of branded merchandise that ranges from T-shirts, tank tops, hoodies and sports bras to leggings, sweatpants and socks. Though the themes, graphic patterns and silhouettes of the clothing and accessories change with the seasons — as well as to reflect the runway and street trends of the moment — one thing remains constant: SoulCycle&apos;s logos, catchphrases or brand name is featured prominently, indicating that the wearer is a proud and active part of the ever-growing and evolving SoulCycle community. SoulCycle initially launched retail in its studios over a decade ago in 2006 (e-commerce followed in 2010), when there was just one location on the Upper West Side of New York City. In 2013, around the time when SoulCycle hit peak trendiness and began expanding into other markets like Los Angeles and the Bay Area, the company released 12 private-label collections per year; back then, Julie Rice, a co-founder of SoulCycle, also noted that apparel sales rose by about 126 percent per year since 2008. For years, SoulCycle would screen-print their easily recognizable logos onto Nike and Lululemon performance gear, ensuring that both riders and instructors felt comfortable and confident during their workouts. In addition, they&apos;ve strategically partnered with brands and retailers to build awareness and further foster their community — even among those who don&apos;t have a studio in their city. Not only has SoulCycle partnered with widely accessible shopping destinations like Target and Shopbop on exclusive product, it&apos;s teamed up with both insider-favorite fashion labels like Public School and well-loved activewear brands (including Fila, The Upside, Koral and APL) to ensure that its clientele can sweat and shop in the same place. Today, as SoulCycle&apos;s studio footprint has expanded to include over a dozen cities in the U.S. and Canada, the company is taking its retail strategy to the next level: It&apos;s releasing its first-ever in-house line of performance and lifestyle apparel, as well as growing its network of retailers, which will include the likes of Nordstrom. Called Soul by SoulCycle, the collection was inspired by insight from the company&apos;s loyal community. "Activewear is a very crowded space, so we&apos;ve really positioned ourselves differently, building our brand in a reverse way," explains SoulCycle&apos;s VP of Retail Caroline Gogolak. "We&apos;re building [the line] off of 12 years of understanding of what our customer wants, as well as feedback on what both instructors and riders want from a design and performance perspective." Gogolak, who co-founded e-commerce site Carbon38 and had a hand in the development of its in-house clothing line, used her background in activewear technical design to help build out a team (including factory partners) that could help SoulCycle compete against the most established performance wear players on the market. The range was tested on instructors and riders of different body types hundreds of times — the collection will include extended sizing on e-commerce through XXXL — and ultimately designed to cater to their needs, giving them exactly what they&apos;re asking for. (For instance, additional bounce support in the sports bras was key, so the design team added a high neckline to better support movement on the bike.) "Instructors are the voice and face of the brand, so they need to be confident when they&apos;re up there on the podium," Gogolak says. From the first road test, instructors were very vocal about their likes and dislikes, even when it came to aesthetic details like prints and decorative elements. Though most American cities are still without a SoulCycle of their own (the current studio count is over 90), Gogolak notes that consumers are still eager to be a part of their community. "Building our own brand, we see a huge opportunity engaging with customers who don&apos;t have a location in their hometown," she says, adding that the company&apos;s logo has become instantly recognizable across all markets. "We&apos;re one of the remaining brands that has a beloved community; it&apos;s such a magical experience [riding] in the four walls, and the collection is a way of giving a piece of the brand to those who don&apos;t have a SoulCycle in their own city." See a selection of looks from the Soul by SoulCycle collection, available to shop now, in the gallery below. Jenna Lyons hopes the line will "motivate you to do whatever activity it is you like to do." Even if you're not a fitness buff, you're going to want to dress like one. SoulCycle is one of the trendiest workouts in the universe right now. Everyone from Lena Dunham to the Victoria's Secret Angels is devoted to the stationary cycling workouts, as are tons of behind-the-scenes fashion industry people. It's been called a cult, and like every good cult, it has a uniform. 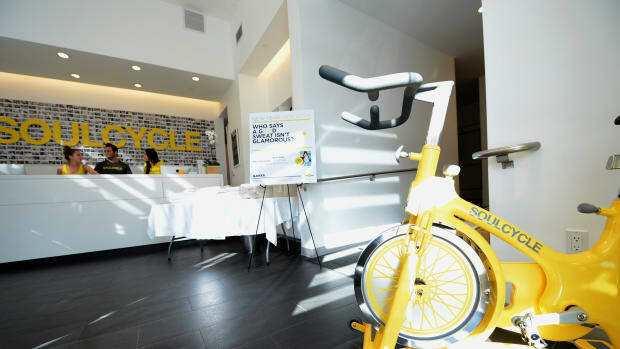 SoulCycle launched retail in its studios in 2006 and e-commerce in 2010. The brand currently releases 12 private label collections per year, plus specialty collections like summer pieces for its Hamptons studios. And no one can get enough of it. Julie Rice, one of SC’s co-founders, says apparel sales have grown by about 126% per year since 2008. So, what's the appeal?